Federal Reserve Chairman Ben Bernanke made a case for new steps by the central bank to boost economic growth, saying inflation was running below the Fed’s objective of 2% and that the economy was on a course to grow too slowly to reduce unemployment. Bernanke made a case for new Fed action to boost growth, saying inflation is running below the bank’s objective of 2% and that the economy is growing too slowly to reduce unemployment. David Wessel, Evan Newmark and Paul Vigna discuss. “There would appear—all else being equal—to be a case for further action,” Mr. Bernanke said in prepared remarks for a conference on monetary policy at the Federal Reserve Bank of Boston. The Fed is considering whether to restart a program of purchasing long-term Treasury bonds to push down long-term interest rates and boost growth. It next meets Nov. 2 and 3, and investors expect the Fed to proceed with such a plan at the meeting, a view Mr. Bernanke did little to counter. However, he added that while such a program could be useful, he also made a case for proceeding “with some caution,” given the uncertainties facing the Fed about whether such a program would work very well. The Fed chairman’s economic outlook was generally gloomy. Business spending has slowed, consumer finances are improving unevenly, housing has remained depressed and job growth next year isn’t likely to be strong enough to bring down unemployment very much, he said. The linchpin of his argument for new Fed action is the inflation picture. During the first eight months of the year, inflation as measured by the central bank’s preferred measure is running at an annual rate of 1.1%, less than the 2% level that many Fed officials see as their long-run objective. Mr. Bernanke said it is of “utmost importance” that the Fed retain the public’s faith in its ability to prevent inflation from shooting higher, but in the short run, “inflation is running at rates that are too low.” He added that there is a risk of deflation, or falling consumer prices. “In light of the recent decline in inflation, the degree of slack in the economy and the relative stability of inflation expectations, it is reasonable to forecast the underlying inflation—setting aside the inevitable short-run volatility—will be less than” the Fed’s 2% goal for some time, he said. The Fed, he said, “is prepared to provide additional accommodation if needed to support the economic recovery and to return inflation over time to levels consistent with our mandate,” he concluded. Federal Reserve Chairman Ben S. Bernanke said additional monetary stimulus may be warranted because inflation is too low and unemployment is too high. He didn’t offer new details on how the Fed would undertake those strategies or give assurances the central bank will act at its Nov. 2-3 meeting. Bernanke and his central bank colleagues are considering ways they can stimulate the economy as the unemployment rate holds near 10 percent and inflation falls short of their goals. After lowering interest rates almost to zero and purchasing $1.7 trillion of securities, policy makers are discussing expanding the Fed’s balance sheet by purchasing Treasuries and strategies for raising inflation expectations, according to the minutes of the Federal Open Market Committee’s Sept. 21 meeting. Futures on the Standard & Poor’s 500 index of stocks rose, with futures expiring in December climbing 0.2 percent to 1,176.30 at 8:17 a.m. in New York. The yield on the 10-year Treasury note fell three basis points to 2.48 percent as of 8:34 a.m., according to data compiled by Bloomberg. A basis point is 0.01 percentage point. Fed officials, concerned that expectations of lower inflation will become self-fulfilling, are debating whether to encourage Americans to believe that prices will start rising at a faster pace so that they would spend more of their money now, the minutes from last month’s meeting showed. That would reduce inflation-adjusted interest rates and stimulate the economy. Still, it “may be difficult to convey the Committee’s policy intentions with sufficient precision and conditionality,” he said. The central bank could also expand its securities holdings, which has in the past been “successful” at lowering interest rates, Bernanke said. The Fed doesn’t have much experience with that tool, which makes it difficult to decide the “appropriate quantity and pace of purchases and to communicate this policy response to the public,” he said. The Fed’s September statement was the first in almost two years of near-zero interest rates to say that too-low inflation would merit looser monetary policy. Prices excluding food and energy rose at a 1 percent annual pace in the three months through August, below Fed officials’ long-term preferred range of about 1.7 percent to 2 percent. 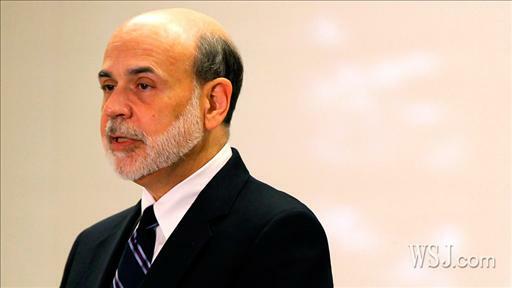 BOSTON (Reuters) – U.S. Federal Reserve Chairman Ben Bernanke said on Friday there was a case for further monetary easing given high unemployment and low inflation, but he offered no details on the central bank’s next step. It was the most explicit signal yet from Bernanke that the U.S. central bank is likely to ease as soon as its next meeting in November. He also suggested the Fed could indicate a willingness to hold interest rates low for longer than currently expected. “There would appear — all else being equal — to be a case for further action,” Bernanke said at a conference sponsored by the Boston Federal Reserve Bank. Stocks edged higher and the dollar hit an eight month low against the euro as investors bet any further asset purchases would help the economy, but would require more money to be printed, debasing the greenback. Prices of longer-dated U.S. Treasury securities fell in part because the speech led traders to believe the U.S. central bank would try to create inflation. The dollar’s sharp drop in recent weeks on expectations of further Fed easing has caused discomfort around the world, with emerging economies complaining the strength of their currencies could undercut their exports. U.S. officials, however, argue the world stands to benefit from a healthier U.S. economy. Bernanke said a prolonged period of high unemployment could choke off the U.S. recovery and that the low level of inflation meant the risk of deflation — a dangerous downward slide in prices — was greater than desirable. However, he said policymakers were still weighing how aggressive they should be if they decide to pursue a further round of asset buying, or quantitative easing, to push borrowing costs lower. “The only question left is the size and scope of QE,” said Boris Schlossberg of GFT Forex in New York. The Fed pushed overnight interest rates to zero in December 2008 and then bought $1.7 trillion in government and mortgage-linked bonds to offer more support for the economy. Policymakers have said further purchases of U.S. Treasury debt would be the course they would most likely pursue to bolster the recovery, and most economists look for a new buying program on the magnitude of $500 billion. Bernanke said that while the central bank has the tools to ease financial conditions further, it still needed to proceed cautiously, adding that it was hard to calibrate the scope of purchases that might be necessary. “Nonconventional policies have costs and limitations that must be taken into account in judging whether and how aggressively they should be used,” he said. Financial markets expect the Fed to launch a new round of asset purchases at its next meeting on November 2-3. The Fed’s easy monetary policy, which pushed the dollar to a 10-month low against a broad basket of currencies on Friday, has drawn the ire of emerging market economies contending with a flood of capital as investors chase higher yields. Many countries, worried about potential asset bubbles as well as weak exports, have taken steps to temper the rise in their currencies, sparking fears of a series of competing devaluations. 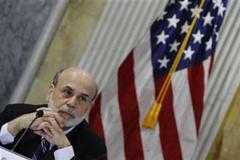 Even though the deep U.S. recession ended in June 2009, unemployment still hovers at a lofty 9.6 percent, and Bernanke noted that core inflation, as measured by the Fed’s favorite gauge, has risen at just a 1.1 percent annual rate this year. He emphasized that Fed officials would like to see inflation at about 2 percent or a bit below. The government said on Friday that the core consumer price index, a more popular inflation gauge, had risen just 0.8 percent over the 12 months through September, the smallest annual gain since 1961. At the Fed’s last policy-setting meeting on September 21, officials debated the possibility of introducing an explicit inflation target and other ways in which they could lift inflation expectations to spur economic activity. Bernanke made clear that a shift in communications policy could be a powerful tool in helping to ease financial conditions, and said the Fed could use its post-meeting statements to indicate the central bank intends to keep interest rates low for longer than financial markets expect.